"Thank you for the outstanding performance at our recent Kids Club… For many of the children, this definitely made their week!". The ONLY thing that will drop is your JAW!! You will be AMAZED as they juggle BALLS, CLUBS, KNIVES, & OTHER CHALLENGING OBJECTS! 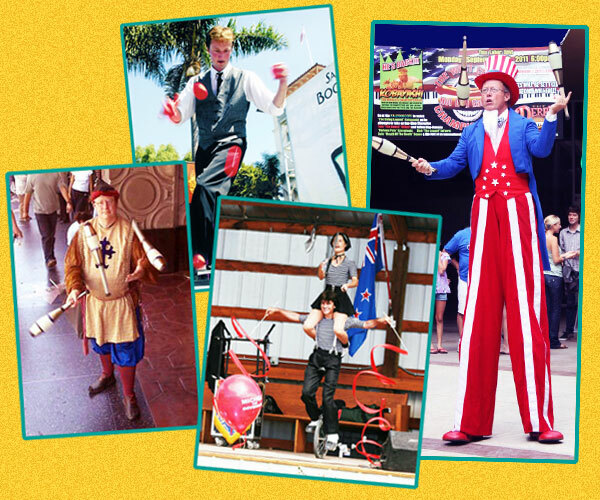 STROLLING: Our jugglers mingle with your guests, adding a circus-like atmosphere to your event. SHOWS: An amazing performance of precision juggling, comedy, and audience participation guaranteed to WOW your guests!! For even more excitement, combine strolling juggling with a show! Kids of all ages are guaranteed to have a SPECTACULAR time!